Cloisonne jewelry – enameled pendant set in 18k gold. 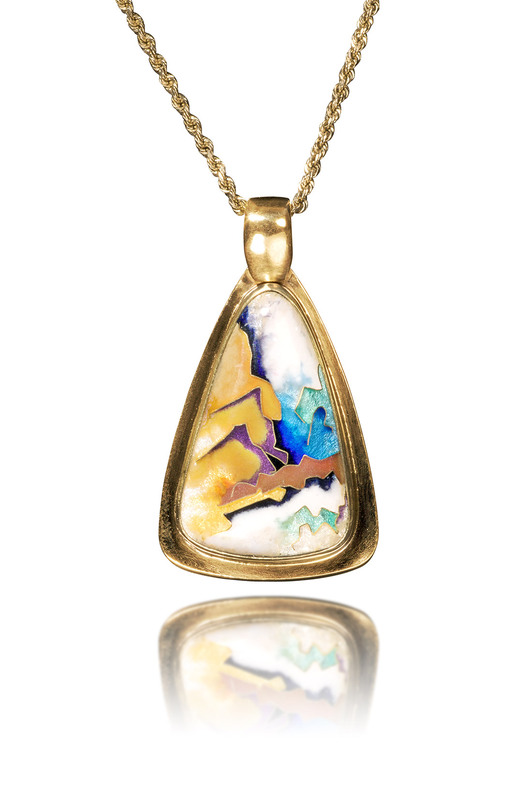 Abstract Pendant is a cloisonne jewelry piece created by Patsy Croft. It belongs to a custom cloisonne collection of amazing enamel jewelry with unique jewelry designs. This jewel was created with the client in mind. After an interview in her home I was able to have an understanding of the types of art she enjoyed. Her home was soft, with a few bright colors here and there. A nice feeling of simple elegance and modern art graced the home. The white opal enamels allowed me to share that soft movement in her choice of art with interlocking colors of transparent enamel. And a custom jewel of cloisonné enamel was born.